Medicago is a developer and primary manufacturer of a wide range of bio-reagents and ready-to-use kits. We can accommodate requests from microliters to liters and from milligrams to kilograms. 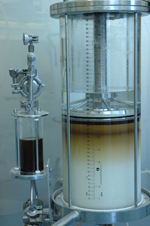 We can synthesise and manufacture special batches with unique specifications, blends and premixes to your requirements in any format or formulation. Private labelling, OEM and product/kit packaging arrangements are also possible. Our facilities are supplied with cGMP-validated WFI and PW water plus Clean Steam. Clean room areas are qualified according to cGMP and ISO standards. As a world-leading producer of biological and chemical buffers in tablets and pre-mixed powders, Medicago is sure to comply with any request you may have. And if you don’t find what you are looking for, we will develop and manufacture your buffer exactly to your specifications. Manufacturing is done in a controlled clean environment using GMP procedures. 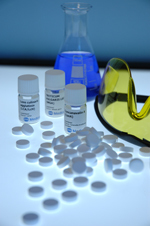 Pre-mixed reagents are exactly weighed according to the specifications of the tablets and powders. Processes are largely automated to avoid operator intervention and contact with products. 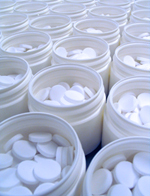 Tablets are packed in clean containers or in blister packs and powders in sealed aluminium laminate foil pouches. Medicago is one of the world’s few primary manufactures of extremely pure lectins. Our state-of-the-art purification equipment and extensive expertise in this area make us a unique partner for customized solutions. Over the years, Medicago has developed expertise in manufacturing bulk and custom-made saponins. These compounds are amphipathic glycosides used commercially in dietary supplements and nutriceuticals. Saponins are also used as adjuvants in vaccine preparations. Medicago develops and manufactures monoclonal and polyclonal antibodies, as well as antigens from viruses, bacteria and parasites. During the last decade, this has represented a steadily expanding area of expertise. We have also developed special skills in producing monoclonal antibodies against very small molecules such as common explosive and narcotic substances, for example. Medicago possesses long and unique experience in the development, construction and assembly of diagnostic, biochemical and chemical kits according to customer specifications on a sub-contracting basis. In addition to developing and producing our own kits for in vitro diagnostic use based on ELISA and monoclonal antibody techniques, we also undertake production of diagnostic kits.